We - I mean I - painted the living room 5 years ago when we moved here...I seriously bought 30 of those little paint samples in every color from green to blue to khaki. We neighbors asked every day, "what color are we looking at now?" There were only 2 things to take into consideration: The color had to compliment my Taittinger Champagne Art (mainly golds) and it had to blend/make the fireplace not look so massive. After much to-do about it all, I went back to basics...the color wheel...yellow and purple are complimentary colors! Whew that design school education is paying off. But life has taken a toll on my paint job and fast forward 5 years later...the purple we selected is looking a bit dingy - we need a shot of brightness...and Mythic paint comes to the rescue with Summers Violets! Checkout the complete tutorial at The DIY Club! The NEW Project Party is happening NOW! Well, I like to compare any home improvement to the child's book "If You Give A Mouse a Cookie." I am painting the family room, the halls, my son's bedroom, and the dining room. I love changing up the house with new colors and splashes of FUN and paint is the perfect way to do this! Stop by soon...for the tutorial on that silhouette wall hanging! 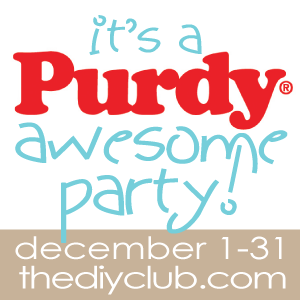 Disclosure: Some of the items,products or supplies have been provided to me free of charge through my affiliation with The DIY Club. This happens to me too. What I think will just be a little project some how snow balls into something much larger! Your new paint color looks great. Love the color!!! I am very guilty of not stopping at what I was originally going to do and it just happens that I spiral out of control, not my fault that I am so dedicated to my work!! :) I can't wait to see how it all turns out!! First, purple is me fave! Second, I love that huge painting on your wall! I just finished my family room reno and finally painted the walls as well. It's amazing what fresh coat of paint will do. Gorgeous color, Holly! Luckily, you can't look through your monitor and see inside my house. I have several rooms that could use a fresh paint job. I am in a standoff with my husband right now over what color to paint the entry. Does the color wheel advise anything on that? That new color is going to look great! It will definitely perk it up. Ooo I am loving that massive print! How gorgeous.